Appellation or Vine Sforzato di Valtellina D.O.C.G. The salient characteristics of this wine derive from the highly individual way in which it is made. It is due to the fact that the grapes are left to wither on frames until December or January with the result that the sugar they contain becomes concentrated and a unique aroma develops. This process is called "Sfursat", which in the local dialect means "strengthened". The wine has a strong, grainy red colour and has a very characteristic aroma which is both ethereal and complex. It tastes full of personality, rounded, alcoholic and well-balanced. Valtellina is a noble wine-making area with ancient traditions. Traditions that are not ignored by the wine-makers at Rainoldi. Considerable experience and a well-developed knowledge of wine-making techniques allow Rainoldi to fully realise the potential of the Valtellinesi grapes and obtain superior wines with delicate and refined characteristics. This wine complements a roast dinner or can be drunk after a meal or on its own. It is recommended to open the bottle two or three hours before serving. The wine should be served at 18 - 20 degrees centigrade. The best glasses to use are clear, transparent crystal goblets. 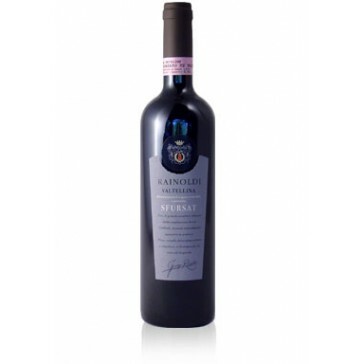 This wine can be aged for a very long time, more than twenty years, if it is kept in an ideal environment. The bottles should be laid horizontally in a cool, dark, humid wine-cellar. For the fifth consecutive year, Wineshop.it has been evaluated as Italy's top wine e-commerce site according to the annual research made by the School of Management of the Politecnico of Milan with the collaboration of Netcomm (the Italian e-commerce consortium). The research, based on more than 200 study cases, makes a detailed analysis of the different sectors of the Italian e-commerce B2c market and their strategic evolution. Click here to download the Executive Summary of the research.